Today I want to share a printable my students love! Rhythm Searches are my fun music version of word searches. 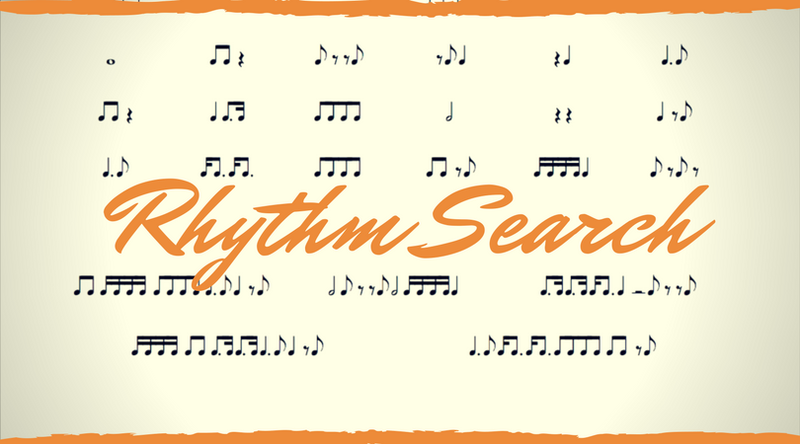 A rhythm search is easy to use in private lessons and/or group lessons. I’ve made two levels to start with this month. Maybe it’s just my students, but we seem to NEED regular reviews of dotted notes. Thus I’m always trying to create new activities that make them practice counting dotted rhythms. The activity is pretty self explanatory so your students will get the hang of it quickly. The rhythm patterns on the bottom half of the page are hidden in the big box of rhythms above. Rhythms can go diagonal, up & down, or side to side (just like word searches). I like to use color highlighters to mark the rhythm patterns as the student finds them but pencils or pens to circle them work fine too. Every time we do a rhythm search, my rule is that the student must also count it out loud. We use Ta’s & Ti-ti’s, 1 & 2 & 3 & 4 &, or word counting (App-le, Grape, Wa-ter-me-lon). We often pull out a drum, shaker or wood blocks to make the rhythm on. Or clapping works great too if nothing else is on hand. After this page is finished, we open up to a tricky piece and count the rhythms out loud while we have our instruments out. Another reinforcement idea would be to send students home to compose a piece using one or more of the rhythms they just found and counted. It’s a great way to keep them counting those tricky dotted rhythms or eighth notes all week! Enjoy this quick rhythm review with a new twist!